There are many rocky points along Florida’s Big Bend. And I suppose there are many places labeled “rock point” along the United States’ coastlines. After all, it’s not a particularly innovative name. But there’s only one Rock Point near Steinhatchee, in Taylor County. And it’s one you should know about if you’re interested in some pretty good inshore fishing. Unlike local Sponge Point, that has no sponges, and Sand Point, which has no sand, Rock Point DOES have rocks. Lots of them. While its rocks offer good cover for redfish and the adjacent flats and backwaters can also add good numbers of spotted seatrout, getting there can be a tedious exercise. Rock Point is only about 3 miles north of the Steinhatchee River channel, but to get there, especially on low water, you need to dodge some offshore sand bars and shallow inshore grass flats. My advice is that you take a northwesterly course from Marker #7 in the channel, staying outside the bars, and SLOWLY and CAREFULLY head towards Rock Point when you’re offshore of it. The shoreward approach towards Rock Point isn’t especially rocky, but it’s important you respect the integrity of grass flats you’ll cross. On low water, you may need to shift modes from your outboard to your trolling motor or push pole. On higher water, usually above 2-plus feet on your tide chart (Use the “Steinhatchee River Mouth” tide station.) you might be able to idle with your outboard jacked or trimmed up. In either case, be careful not to damage the sea grass. Doing so is a fineable offense. The rocks at Rock Point are not pebbles. Some are boulder-sized and the niches and canyons between them offer shelter to predators waiting for schools of bait, usually small mullet, to cross the point with the tide. Knowing that, and that it happens on almost any tide and in any season, should give you a clue to fishing this point—and any others you might encounter that are similarly structured. The tide runs across the point, so set your boat up in order to make long upstream casts. Don’t crowd the point. This may mean casting into the wind, but larger and heavier lures will work here. The “hatch” you’re trying to match are likely to be 6-8inch mullet, so big lures like MirrOlure Top Dogs or D.O.A. PT7s are good choices. If the tide’s full, you might try something that suspends, like a Paul Brown Devil, but be careful not to work them too deep or too slowly. If you do snag one on a rock, break it off and try to fetch it after the catching’s done! The fact is that “one point don’t make a whole day of fishing”. So, while you’re in the neighborhood, take advantage of some other October options here. The seagrass beds you’ll cross on your way to Rock Point will finally be devoid of summer scallopers and the trout they scared away should have returned to fatten up for the winter. There are some deeper potholes to the southwest of the point, and more important, a deeper creek channel in the bay to the south. The small rock pile on the north side of the creek bed is a good place to try, and a drift into the southeast corner of the bay is a worthwhile exercise, if the mullet are jumping. The tip of Rock Point is actually a small island, and the north shoreline inside the cut that separates it from the mainland can also be fishy, provided you take a stealthy approach. For some reason—maybe lack of pressure—the redfish along this shore can especially spooky. Long casts and silent running are a must. This particular Big Bend “Rock Point” is pretty typical of many similar points that you’ll find from the Suncoast Keys in Citrus County, all the way to the shoreline near St. Marks. Learning each one might take a lifetime, but having knowledge of just a few can make for lots of fun days of fishing. 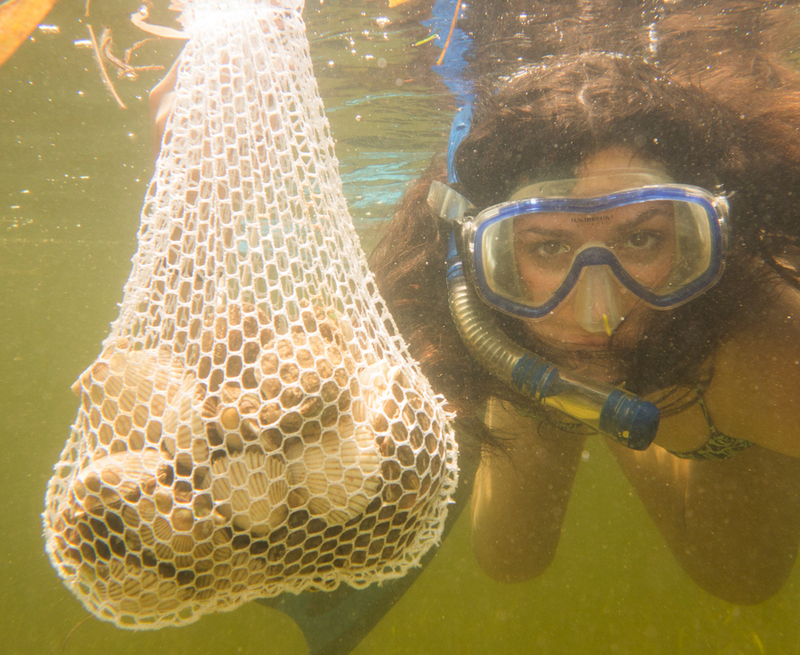 In the late summer, water visibility can hinder and slow the harvest of bay scallops. This year, they’re plentiful along our big Bend coastline, but are often hard to see. You may not catch thousands of scallops in murky water, but if you work hard, you’ll come home with a nice dinner! We’ve had more than our fair share of rain on the Big Bend, too. Mornings have been calm, but with high humidity and high air temperatures, thunderstorms have been building up every afternoon. Usually they form on shore, but some can eventually drift off the coast in the late afternoon, depending on the strength of the east coast sea breezes. What that means for you, the scalloper, is that you need to take your trips early, watch the radar (use the Weather Bug app on your smartphone! ), and try to get back to port by mid-afternoon at the latest. Snorkeling for bay scallops is a fun, family adventure! Despite the amount of rainwater we’ve seen in ditches and pastures miles from the coast, the visibility of the Gulf waters isn’t as bad as I expected. Scallopers north of Steinhatchee and Keaton Beach are doing well, especially off Piney Point and off Dekle Beach. The only thing I can’t predict is just how long the visibility will be good. It usually takes several weeks for the leaching cycle to complete. Don’t let thunderstorms like this one come between you and your home port! It’s back! The Kevin’s Fine Outdoor Gear & Apparel Redtrout Shootout will take place May 30, 2015. Cash rewards will be paid out to the top 10 teams weighing in the heaviest combined weight of (1) redfish and (1) spotted seatrout. With an entry fee of $75.00 per angler and a guaranteed cash purse, you and your crew will want to get registered today! This unique inshore fishing tournament allows teams to launch their boat at any boat ramp, fish their favorite holes and then weigh their catch in at Jerry’s Bait & Tackle located at 664 Woodville Highway, Crawfordville, FL. Click here for map! If all that sounds good wait till you hear the rest. We have everything from Banquets & Kick Off parties featuring live music. So be sure to take a few minutes and navigate the website to see what else we have in store for this years edition of the RedTrout Shootout. Click here today to register! USCG licensed Captain Steve Kroll is your host and guide for a great day of near shore and flats fishing, or scalloping, on the beautiful Big Bend region. Captain Mark Lord, a Florida Flats Fishing Guide, is a U.S. Coast Guard licensed captain, with years of experience fishing and guiding in the Steinhatchee area. The first month of Florida’s 2014 recreational scallop season has been a busy one at Steinhatchee and Keaton Beach. Scallop season is always the busiest time of the year for these Gulf ports, with record sales at marinas, busy motels, waits for tables at restaurants, and busy boat ramps. Rental boats are sometimes available on short notice, but for the most part, they’ve been reserved for months. The same goes for lodging. Scalloping isn’t hard work. About all you need to be able to do is snorkel in 3 to 6-feet of water and to scoop them up by hand. This year, you’ll spend a bit more time catching your 2-gallon (in the shell) limit, but the scallops ARE there. Scallopers leaving from the Sea Hag, River Haven and Good Times marinas seem to be having the best luck to the north, off Clay Creek, Fishermans Rest, Big Grass Island and Piney Point. And unlike last year, the scallops are close to shore in very clear water. The best time to scallop is during the lower phase of the tide, and while the sun is overhead. The sunlight draws the scallops to the top of the grass, making them easy to spot and the low tide makes reaching down for them from a swimming position easier. For a general look at scalloping, take a look at “Bay Scallops, The Gulf of Mexico’s Tastiest Treat“. The new Citrus County guide features completely updated boat ramp and marina locator that Florida Sea Grant has published for the last several years. And don’t forget about the companion, the Taylor County scalloping guide and marina locator map. Both guides feature historically abundant scalloping areas, boat ramp and marina locations, rules and regulations, and recipes! Taylor County, on Florida’s Big Bend, “gets it right” when it comes to access to the Gulf Waters. The public boat ramp at Keaton Beach is one of the best, easily accessed with good facilities and parking. Now, with the addition of a huge new parking lot for cars and trailers, just across CR361. In the past, when the parking lot filled, boaters were forced to park alongside the roadway, often as far away as a quarter-mile.